All is Fair takes everything we know – or think we know – about the Split Worlds and muddies the water. The slow pace of previous instalments is replaced by dizzying acceleration as new information, new characters and unexpected twists broaden the scope of the action. My final comment on Any Other Name was that All is Fair needed to re-integrate the Agency, Sorcerer and Elemental plots and push them forward – it does just that, with a vengeance. Cathy awakens in hospital after the stabbing, only to be Cursed by Mr Bennett of the Agency, who is determined to ensure she can’t tell anyone what she knows. And – who would’ve guessed – it turns out that this forcible silencing of women’s voices (and indeed men’s, but we see no examples of that) is a common and more or less socially acceptable way of controlling the outspoken. It’s an important lesson for Cathy: rocking the boat is not tolerated. Not only that, but Will now insists she has a bodyguard to protect her from further attacks by (as he believes) the Tulipas. She – and we – must take on faith that this is a sign of his regard for her, rather than a less than subtle way of monitoring her activities – but it’s not lost on Cathy (or this reader) that the bodyguard is, naturally, employed by the Agency and presumably reporting back to Mr Bennett. Newly-minted Duchess of Londinium or not, Cathy is going to have to be circumspect. …or not. Subtlety flies out the window as Max invites her to deliberately breach the Split Worlds Treaty in exchange for information on tracking down her former governess, Miss Rainer. Cursed or not, Cathy is determined to upset the apple cart for the Agency and find a group of like-minded people who can help her bring Society into the 21st century. She’s more than happy to do something spectacularly illegal to get what she wants. Will’s actions in seizing Londinium have repercussions as the former Duke’s wife, Margritte Tulipa, flees to Oxenford and wins the support of Rupert, Sorcerer of Mercia. Neither Rupert nor Ekstrand attend the Moot calls by Ekstrand (being as paranoid as each other), and find themselves the only surviving Sorcerers of Albion when everyone at the Moot is struck dead. Each assumes the other is guilty, leaving Max to try and work out who the real murderer is. Rupert is a joy. As powerful and as paranoid as Ekstrand – and at least as old – he is otherwise unrecognisable as a Sorcerer. He rules Oxenford Nether as Chancellor of Oxenford, and has adopted modern technology (and language) with glee. Wearing a dirty hoody and swearing like a sailor is no way to impress Margritte Tulipa, but he takes a shine to her anyway because he likes clever women. Holy feminists, Batman! Okay, not quite – he likes clever people, and he doesn’t have any hang-ups about their gender. He’s also a psychopath; he’s much too used to having all the authority and no accountability, and he behaves accordingly, which is bad news for Will (and Ekstrand). He instantly joined Lord Poppy in my ranks of characters who I am going to enjoy for the badness of it. …which brings us to Sam. The griefstricken Sam has been swept up by the mysterious Lord Iron, who claims to feel some sort of guilt for Leanne’s death – whilst denying any part in it. But Leanne has left a legacy that Sam (with his white knight tendencies) will find it hard to resist, and Lord Iron has plans of his own for the confused young man. I’ll say nothing more because SPOILERS, other than that I saw absolutely none of his storyline coming and it delighted me even while it made me see red. While Sam means well, his emotional intelligence and self-perception can be cupped in a teaspoon; at least Will Reticulata-Iris knows when he’s being an asshat (although as he has fewer white knight tendencies, he’s also capable of much, much worse things – if still not as bad as his brother Nathaniel). All is Fair continues in the vein of Any Other Name in being a huge amount of fun interspersed with loud yells of “GODDAMMIT WILL NO” (and occasionally, for me at least, “GAAAAAAAH SAM“). Expect further moments of rage as Emma Newman continues to tighten the screws on socially-acceptable misogyny mixed with the heady delights of a young woman realising her full potential. As Lord Poppy observes, such a thing can destroy the worlds themselves – and I think it will be glorious to watch. As I said at the start: be careful what you wish for. 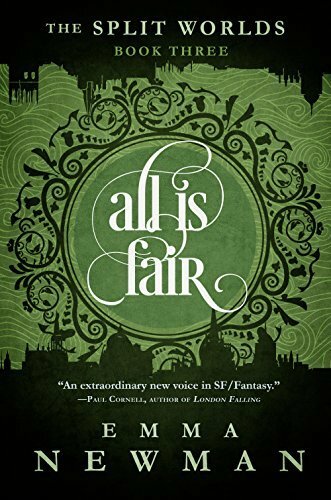 All Is Fair is available now as an ebook and will be re-released in paperback on August 3rd.